Choosing a starting point and designing your wedding invitation is no small task. There are tons of small details to decide on, and so many options that it can be slightly overwhelming to even think of where to start. Luckily, online retailers have zeroed in on how to make this process easier for couples heading for the aisle. Companies like Minted, Paper Source, and Invitations By Dawn offer hundreds if not thousands of options for invitations (and save the dates and thank you cards, by the...MORE way), which means you're almost guaranteed to find an invite that captures the spirit of your celebration. Plus, nearly all the sources we've gathered offer free samples or sample kits, so you can get a literal feel for your invitation before you commit. We love Minted because they offer customizable designs from independent artists. So you get a unique and personal feel thanks to unlimited editing on your special details, even from an incredibly popular resource for couples. This is a great choice for those who want an invitation that feels custom-made without the cost. The more invitations you order the less they cost, but prices hover around $2 each for standard invites, and up to $10 each when you incorporate letterpress or metallic foil details. Oscar De La Renta. Kate Spade. Kelly Wearstler. These are just a few of the designer names you'll find as you browse the wedding invitation offerings from Paper Source. They host a huge selection of designs to choose from, and those designs can often be further customized with your choice of colors and fonts. Prices start around $2.50 per invite, and the more you order, the less each one costs. Paper Source is perfect for couples looking for a sophisticated design that doesn't feel too stuffy. The Wedding Divas paper Paper Divas collection from Shutterfly offers a smaller, more tightly curated selection of wedding invitation options. You can sort them by theme, ranging from modern to whimsical, rustic and photo invitations. Most designs are extremely affordable, starting at about $1.50 each, which means couples on a budget can find the look they want at a great value. From elaborate lace laser cut-outs to ribbon ties and twine ties, Invitations By Dawn is a great wedding invitation resource for brides and grooms looking for an elegant, traditional invitation. Prices range between $1 and $5 per invitation, and the more you purchase, the less each invite costs. Etsy is a treasure trove for any couples looking for a truly unique and one-of-a-kind design experience for their wedding invitations. There are literally thousands of artists and shops that can create all manner of custom wedding suits or simple card-and-envelope combinations. For example, this artist, Kathryn Selbert, can create a custom illustrated portrait invitation suite for $10, then it's up to you to take the digital files to a printer and have the cards created. 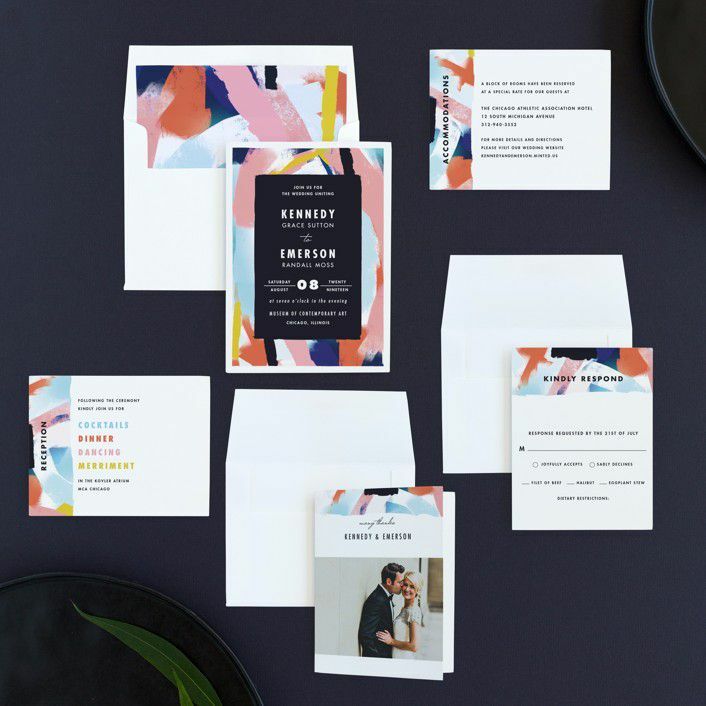 Hip and sustainably minded couples will love the invitation designs from Paper Culture. They use only 100% post-consumer recycled paper, and for every order placed, the company plants a tree where reforestation is most needed. The designs from Paper Culture are modern and fresh, with bold fonts and bright colors as well as foil details in designs that range from elegant and simple to pretty and whimsical. Prices hover right around $1.50 per card—making Paper Culture a cool and affordable choice for couples. Romantics, right this way! Smitten On Paper has a very distinct point-of-view; their cards and invitations are dominated by minimal sans-serif fonts, floral designs and gold foil. Every design they offer can be completely customized, and couples are given a "personal designer" to help execute their vision. Sample invites cost $5, while finale invitation suites cost $12 and up each. Cute, sweet and affordable are the three words you need to know about Papier's selection of wedding invitations, save the dates and envelopes. Colorful illustrations, photo options and cheerful fonts are ideal for couples who want a casual and playful invitation to set the tone for their wedding. Prices hover between $1 and $2 per invitation. Vistaprint takes a slightly different approach to wedding invitation design online. First, you choose the invitation shape, size, format and paper, then you are forwarded to the design templates to customize the look and details of your invite. Pricing starts at under $1 per piece because you fill in the information and choose the fonts and placements yourself, and the design options run the gamut from casual to formal, with photo options, illustrations, and gold foil detailing too. We like Magnet Street because all they do is weddings! The allow you to browse invitation ideas by size, theme or in-house collection, and offer full suites as well as more simple single-sided cards, depending on your needs. Prices vary depending how complex your invitation becomes, but per piece, they start at about $1 and best of all, perhaps, envelopes are included!